I'm not normally one for coloured eyeshadow, day to day a neutral smokey eye is my kinda thing and I think that's what looks best on me. Some time last week I was feeling brave and attempted a bright blue eye look with Urban Decay's eyeshadow pencil in the colour 'Clash'; it's such an amazing colour, but it looked absolutely terrible on me. I don't know if it's the whole 'blue makeup doesn't look good against blue eyes' scenario, (or if the harsh truth is maybe at twenty five I'm too old for bright eyeshadow- sad times) but I had to remove the lot and start again with more trusted colours. The only time I really venture into coloured eyeshadow is if I'm doing an evening smokey eye; I'm quite partial to a bit of purple, green or navy blended into black or grey, and find it doesn't look too 'rainbow clown eyes.' I'm ever-faithful to my trusty Naked palettes, but rather than having to dig around for single coloured shadows to go along with them I thought this would be handy as my 'night out' palette. It contains everything you need for a dramatic evening smokey eye with a bit of colour, and because all of the shades are matte it's a bit different to most of the shimmery sparkly eyeshadows I currently own. Matte eyeshadows are notorious for being badly pigmented, look in any budget eyeshadow range and it's always the shimmers that perform better (I'm looking at you, MUA). But as you can see that's clearly not the case here, some of these shadows are so dark and highly pigmented they were like swatching ink. They translate just as well to the eyes as well, and although they kick up a bit of dust when you use them they feel much more expensive than they were. I found there was a bit of fallout each time I've used this, but I think it's to be expected with more intense colours. I always think it's best to do your face makeup last when you're doing a darker eye look; you just know that there's always going to be some wayward eyeshadow dust that finds its way onto your cheeks, which I'm sure you'll agree is the most annoying thing ever on fresh foundation. The only shades that don't really excite me in this palette are the two flesh toned colours, but I'm not too bothered as I'm definitely not short of neutral eyeshadow and didn't buy this for the lighter shades anyway. You could still create a daytime neutral eye look with this using the browns, beiges and white if you wanted to travel with this palette, but in my opinion it's much more suited to bold, striking looks. If you've got a spare couple of quid knocking around in your handbag and are in the market for some dramatic smokey eyeshadows, pop into Superdrug and treat yourself to one of these beauties. What's your favourite product by Sleek? I have been dying to get my hands on those sleek palettes. 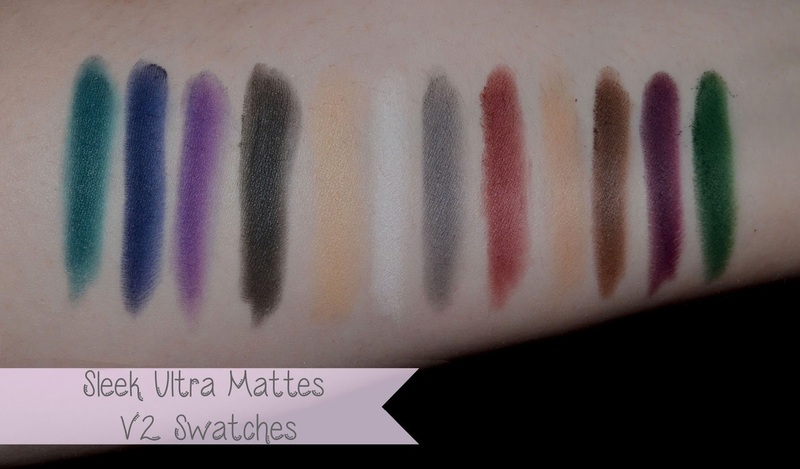 Those and some others are not allowed to be shipped to the US :( Great swatches! I have this palette, but I haven't used it yet. I'm very excited, because your swatches look AMAZING! I don't think the age matters when it comes to color, at least not until the 30s maybe. I mean, I'm a bit older than you (less than 30 still), but I really like to wear bright colors, lol. Then again, it could just be me. Either way, neutral eyes make your eyes look even more beautiful! They both look amazing! I've been dying to try some Sleek products but shipping to Malaysia would be a bomb! That looks like a gorgeous palette! I tend to stick to neutral and light colours cause I'm afraid bright ones would be too over the top but I guess I have to try it to judge! I absolutely love the Sleek palettes and have so many I will definitely go and get this one the colours look amazing! Love your blog and have just followed. Maybe you would like to check out and follow ours? Arr this is the one you were on about, I think the one I have is the brights version as I was on a bright eyeshadow kick at the time. I love the Palletes (13 and counting *cough*),the blushes and I really want to try the Pout Paints as the artist in me wants to mix the colours to see what I get :P .